Through the years at GC, we have come to the realization we can do more good by working WITH the racing industry. Our first greyhounds came from people within the racing industry that believed greyhounds should be pets after retirement and made it happen. We've built up a good working relationship with owners, trainers, farms and kennels in FL, and many other states, believing this gives us the opportunity to help greyhounds in the best way possible. By working with the people that own, race and raise greyhounds we get valuable information about the dogs from the people that know them best. We encourage our volunteers and members to do their own research and form their own opinions about racing. We schedule educational trips to tracks, racing kennels and farms so people can form their own opinion based on facts and personal experience rather than rumors. Among our members we have families who regularly attend races, people that own racing dogs and people who don't care for racing. Our official stance is "racing neutral". We are against abuse, wherever it happens, and for greyhounds, wherever they are found. As such we accept all NGA (National Greyhound Association) greyhounds, as well as AKC dogs, with equal welcome regardless of their original location or previous adoption history. 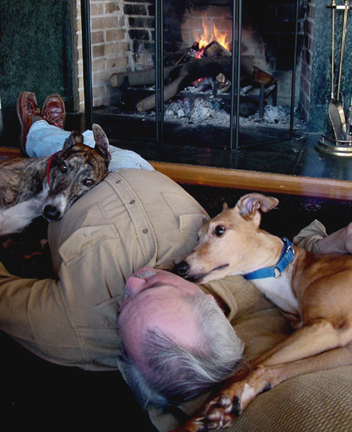 In helping every greyhound who needs us, regardless of AKC, NGA or original place of adoption. In the equality of love, without discrimination of race, creed, national origin, or belief. In the formation of a group based on support, guidance and fun for all members. In knowing each of our prospective families and each of our available dogs, then to the best of our ability make the best possible match. In creating a warm, friendly group for our families to stay in touch and grow together. Providing an opportunity for every members to be involved as much as they wish, using their own skills, abilities, and resources. Beach Bound Hounds in Myrtle Beach, SC. 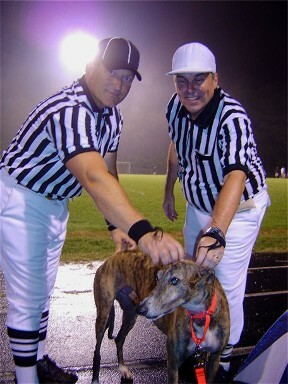 This is a weekend for all greyhound owners and their dogs. Activities include beach walks, a pet blessing, contests, local shopping with the dogs, and much more. Spring and Fall Picnics, Lake Greenwood State Park, Greenwood, SC. Picnics at the lake for greyhound lovers to relax and enjoy swimming with their dogs. GC is organized with many activity levels so that families can choose to help in any way they feel comfortable. We encourage our folks to be as active as they like and contribute whatever their own unique skills and abilities have to offer. We feel that EVERY layer of volunteer activity is important and a vital part of the work we do. We LOVE our volunteers! Directors: GC is organized as a 'director-driven organization', meaning the Directors make the emergency, life or death decisions, as well as coordinating the daily operations, financial considerations and adoption efforts. They take responsibility for the work of GC including the approval or denial of all applications, setting group policy, arrival of dogs to the program and their foster placements, and being available to assist the efforts of all GC members 24/7. Kim maintains the backbone of the website with updates incorporating participation from all group members. Core Group: Although the directors are responsible for many of the major decisions in GC, they could not do so without the help of an active and supportive management team. Each Core Group member chooses to help out in specific areas by taking on responsibilities for one area. In addition, the members of the Core Group make themselves available in emergency situations and add an important voice to the "big" decisions made by the directors. Core members are vital for the tasks of hosting GC events, acting as area adoption reps across the state, suggesting and implementing new ideas, and investing time daily to keep the normal activities flowing for our members. GC is very thankful to have such a wonderful, resourceful group of people! Great Resource Families: Resource folks are families that serve as information and referral members. They are particularly active in helping potential families in outlying areas gain support and adoptoin assistance. We think of them as 'satellite' representatives and they're more than happy to help you.